I,m glad you wrote an orbit on Fred Grove. I was so lucky that I new Fred Grove for more than ten years. I wrote him a personal letter a long time ago and that was the start of a long friendship. Twice I and my wife visited Fred and his family in Tucson and we also met his family and his friend.Fred and I corresponded for many years and when his sight failed, I called him and we had long talks on his books and everyday life.Fred was a a great person and a fine author. His works will live on. One of his last published books was a collection of short stories: THE VANISHING RAIDERS.In this collection you find some of his greatest stories, published here for the first time. There is also a story about Fred and his horse of his childhood in this collection.Fred was one of the rare authors who wrote excellent short stories and novels alike. His works will live on as long as Westerns are read. 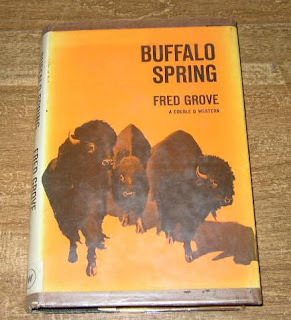 I recommend any book by Fred Grove.COMANCHE CAPTIVES and BUFFALO RUNNERS are musts for any Western buff. Thanks, Pony, for your comments. Sounds like Fred Grove was a great man, besides being a good writer.